Above photograph by Akihisa Okumoto. Last night saw a celebration to mark the 3rd anniversary for Grimoire, as well as marking the opening for it's sister store, Grimoire Almadel. It was a bit of a costume party, so you'll find everyone's outfits a bit exaggerated and over-the-top even for Dolly Kei. On the main Grimoire blog, the post on the event (posted by Kaori?) is giving a lot of thanks, and definitely appreciative of the support from fans and customers over the years. It also says the dj was really good, everyone was dressed really well, and the dancing was really great. That the party was lively and felt like a dream. It also says that FRUITS documented the event as well, so hopefully we'll see some snaps from them as well! Click here for the entire Grimoire blog entry and more snaps! 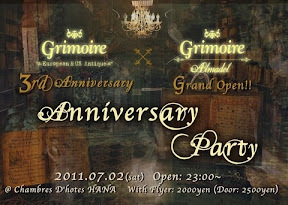 The Grimoire Almadel blog also has an entry on the party, posted by Hitomi. She thanks everyone, and says she and the staff were very surprised and happy about the turnout and how lovely everyone was dressed. Heri, "Lady Knight in the Dark"
Easily one of the most gorgeous hair pieces I've ever seen. Saki, "Deep Night Dancer in forest"
She definitely went a bit risqué with this look. I was surprised when I saw it, but she looks amazing! 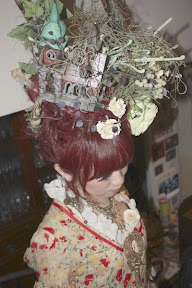 And again, another amazing hair piece. I love how she looks a bit Marie Antoinette-ish. Click here for the entry on the Grimoire Almadel blog, including the rest of the staff snaps! And just because: This was Hitomi's hat! Click here for Hitomi's DropTokyo blog entry. DropTokyo.com itself has some great shots as well. 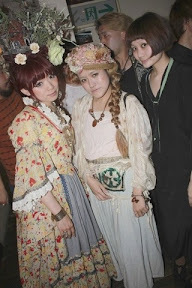 I love looking back at the anniversary party snaps from the last three years, and seeing how Dolly Kei has developed and evolved over this period. As well as how the personal styles of the shop staff have changed and become so uniquely their own. Here's to many more years of Grimoire and Dolly Kei to come! It thrilled me to no end! I'm so in love with the looks from the party!